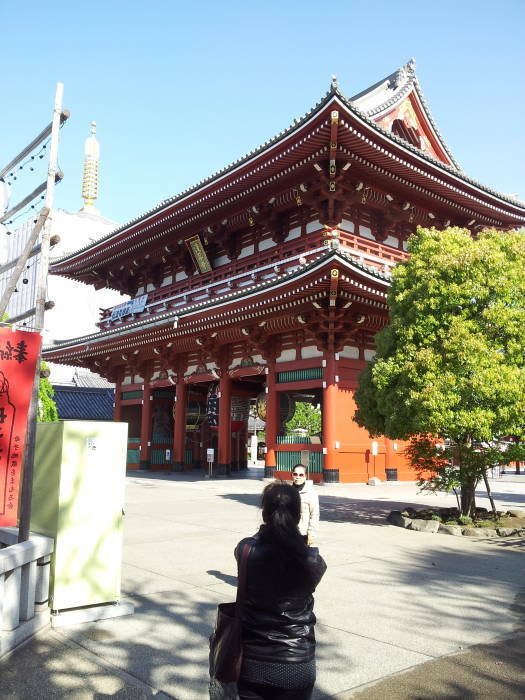 We're visiting the Sensō-ji Buddhist temple complex in Asakusa, in northeastern Tōkyō. 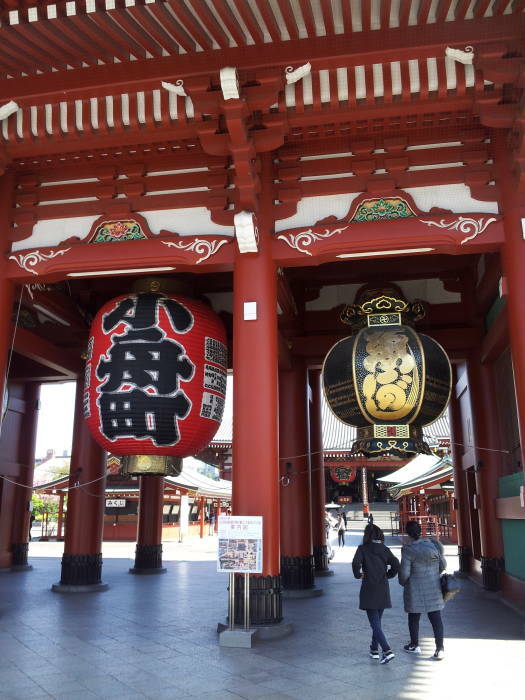 We have passed through Kaminari-mon, the outer gate, and walked along Nakamise-dori, a narrow street lined with shops. 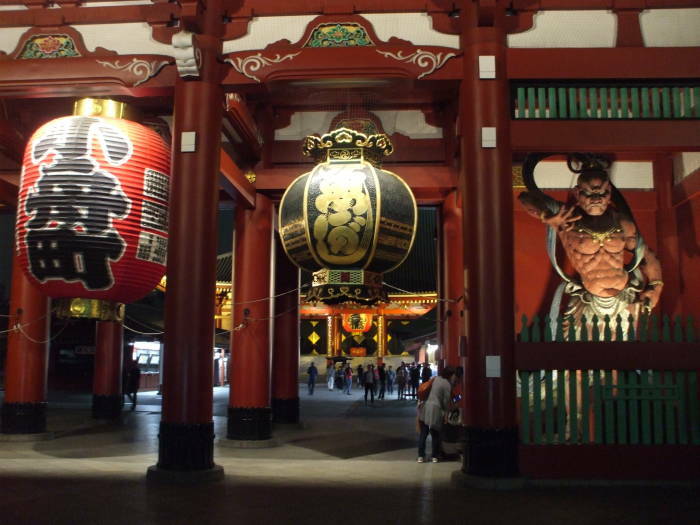 Now we have arrived at Hōzōmon, the large inner gate. It's 21 meters wide and almost 23 meters tall. A gate like this marks a boundary where you move into a more sacred space. There are three doors or passageways. Niō guardian figures, also known as Shukongō-shin, stand in alcoves to either side. 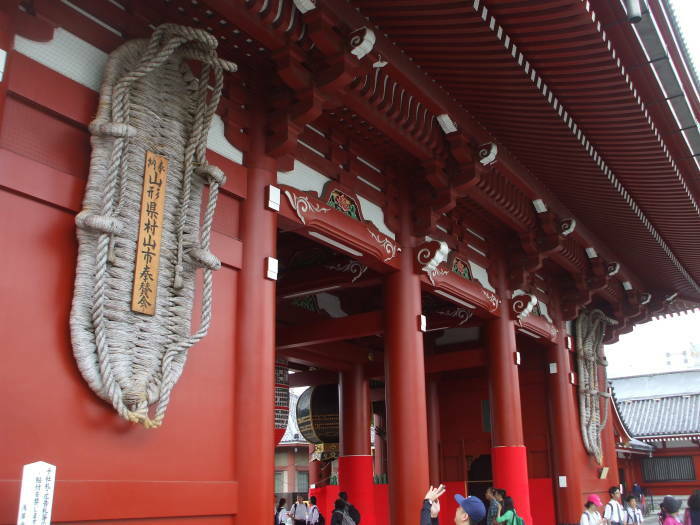 Unlike the outer gate, the Hōzōmon is entirely Buddhist. The Niō are Hindu deities who have been incorporated into Buddhism as protectors against evil spirits. 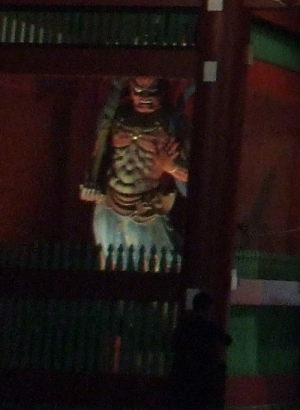 Their fierce appearance keeps demons and thieves out of the temple grounds. 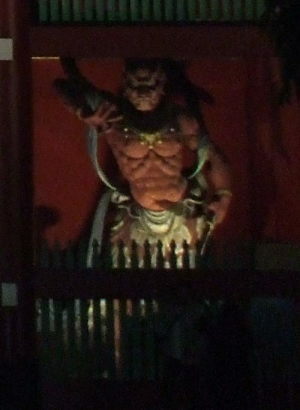 Agyō stands to the left as you enter, wielding a vajra or thunderbolt. Ungyō is on the right, empty-handed or wielding a sword. You almost always find that the protector on your left has an open mouth, pronouncing the sound of the Sanskrit letter अ or A, while the protector on the right has a closed mouth, pronouncing the sound of the Sanskrit latter म or MA. Together they pronounce the sacred syllable Aum or ॐ.
Aum is the sacred sound of Hinduism, but it is used as a mantra in Buddhist, Jain, and Sikh practice. Agyō wields a vajra and says अ or A.
Ungyō wields a sword and says म or MA. Behind them, on the inner face of the gate are Buddha's Sandals, the waraji, made of rice straw. 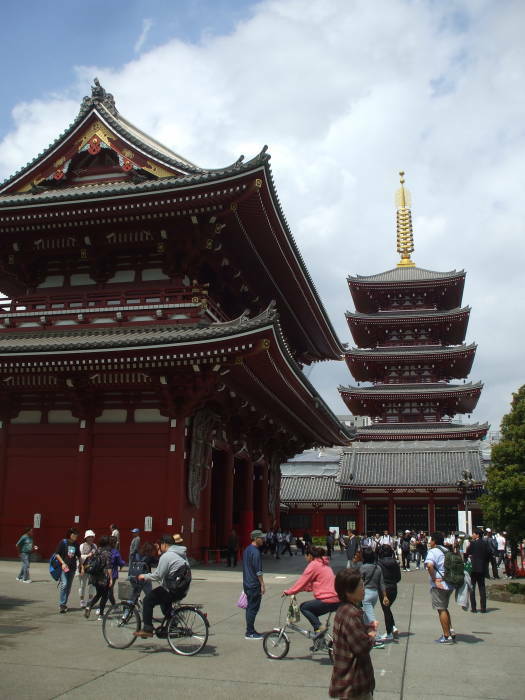 A pagoda (or tō in Japanese) stands to the west side of the gate. This is the Goju no Tō. Pagodas were originally reliquaries containing ashes of the Buddha. They were initially based on the Indian stupa or hemispherical dome tomb. Now you might see Tō-ji used to refer to a pagoda that functions as a Buddhist temple (or -ji), as this one does. The vertical shaft extending out the top of a pagoda is the sōrin. A pagoda and its sōrin is a Buddhist structure, but in Japan Buddhist temples and Shintō shrines are frequently blends of the two traditions. A sōrin might be a wooden shaft supporting bronze rings, or it might be a single piece of carved stone on a monument or grave marker. The wood and bronze version, as seen here, is specifically a tahōtō. Its base represents a circle of lotus petals, typically eight. The lotus blossom, the ukebana or Receiving Flower, rests on an inverted bowl, the fukubachi, which in turn rests on the base or dew basin, the roban. This assembly covers the hole in the roof through which the sōrin shaft extends, so the bottom piece is divided into the same number of sides or segments as the roof. The central shaft extends up, with the kurin or the Nine Rings making up the most prominent part. The fūtaku or wind bells may be hung on the rings. The hōju or hōshu, the Wish-Fulfilling Jewel, is at the very top of the shaft. In between the Jewel and the Nine Rings are the Water Smoke, suien, vertical perforated metal sheets set at right angles, and the Dragon Vehicle, ryūsha. 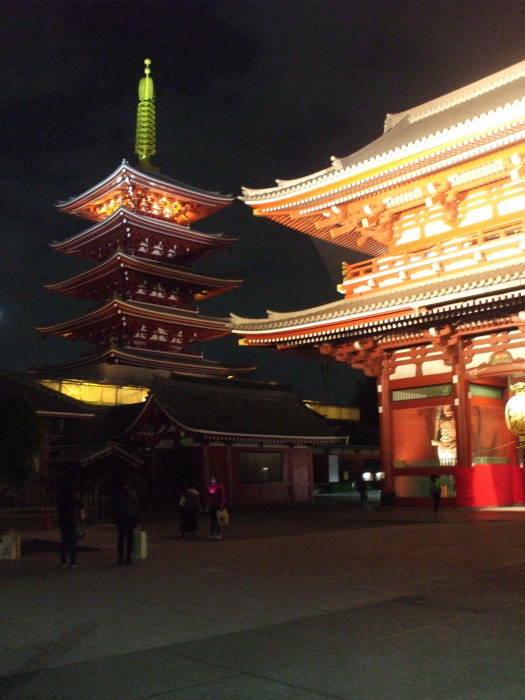 This pagoda is the second-tallest in Japan, at 53.32 meters. Taira no Kinmasa built the first Hōzōmon in 942 CE. It burned down in 1631, and the Shōgun Tokugawa Iemitsu built a replacement in 1636. That one was destroyed in 1945, and current replacement was completed in 1964. 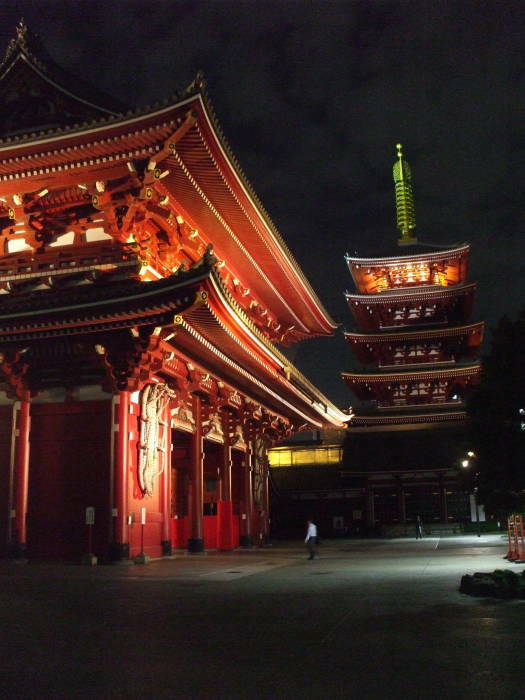 Since the current version is built from steel-reinforced concrete, its upper story houses the Sensō-ji's sutras. The temple's copy of the Lotus Sutra or Saddharma Puṇḍarīka Sūtra is designated a Japanese National Treasure. Its Issai-kyō, a complete set of Buddhist scriptures, has been designated an Important Cultural Property. Yes, it's really built from steel-reinforced concrete. But it certainly looks like it's built from wood. 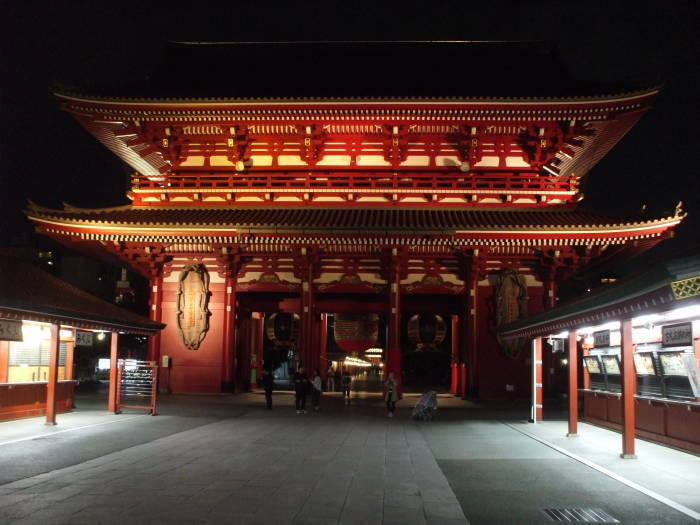 The area is open in the evening, after the Sensō-ji temple has closed for the night. Above we're looking through the gate, under the copper tōrō or lantern, to the front of Sensō-ji. 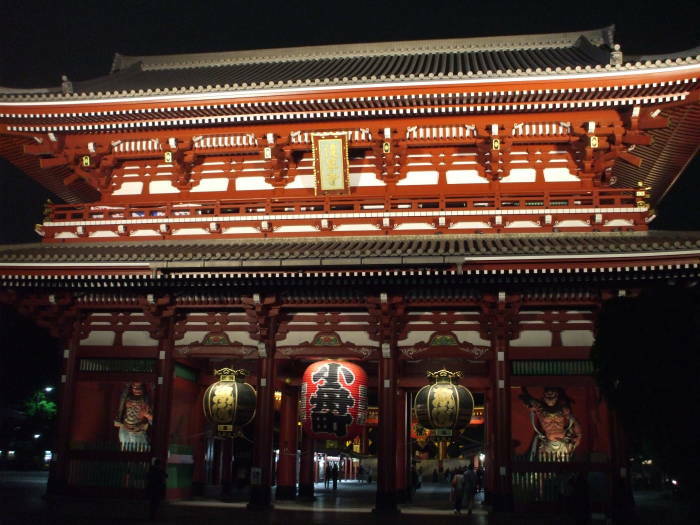 The gold and black panels are doors closing the entrance to the main hall of the temple for the night. 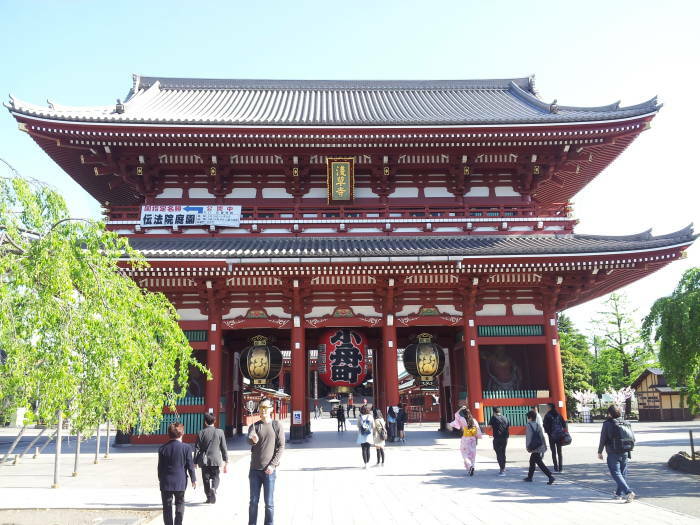 Now we are arriving at Sensō-ji, the large temple.